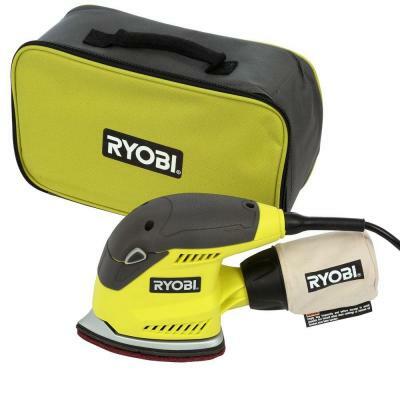 upcycling – an introduction to power tools. Two months ago I moved for the fourth time in four years. Since college I’ve lived in many apartments with many configurations of many roommates. This most recent move was significant because it is the first time I have ever lived with a boyfriend. As always, I was excited at the chance to define a new aesthetic in a new space and was intent on making sure our little apartment would embody that intangible quality of feeling, truly, like “home”. The overall experience of merging two lives into a one-bedroom apartment is something I will speak to in another post. 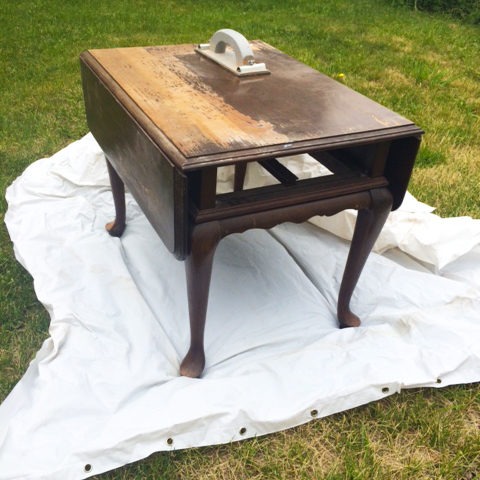 For now I want to share another new experience this move has brought – my first venture into refinishing furniture! My aunt lives in the home that used to belong to my grandparents. Behind her house there is a structure we all affectionately refer to as “the barn” which effectively stores all of the furniture discarded by anyone in my family for the past 40 years. Naturally, when preparing to move in with my boyfriend, I went “shopping” in the barn. 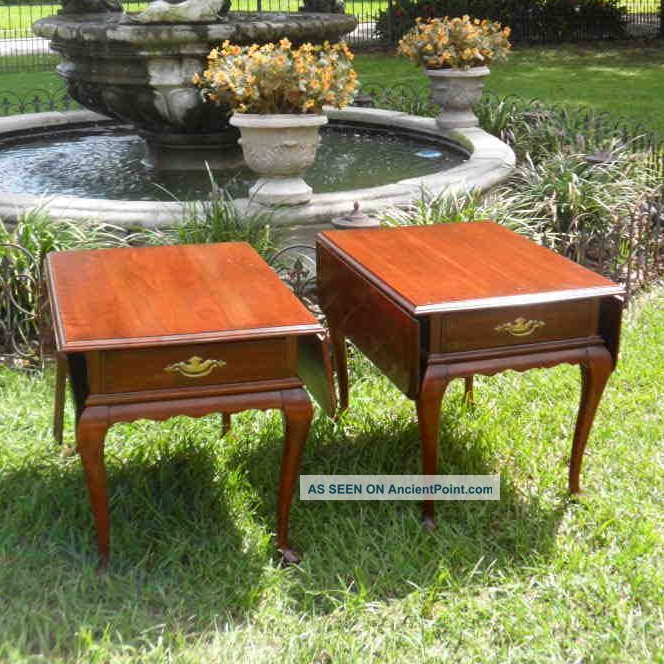 I really wanted two end tables for our living room and was excited to stumble upon two of these Ethan Allen drop-leaf tables that had previously belonged to my parents and before that, to my grandparents. I had refinished another table about a month earlier and the original stain on that table had sanded off pretty easily so I wasn’t expecting the project to be especially difficult. It quickly became apparent that top sides of the tables had been sealed with a varnish. Varnish – it turns out – is basically impossible to sand down by hand. So we went to HomeDepot and bought an electric sander. The sander ended up being very easy to use and really helped on the legs and underside of the tables where there was no varnish to remove. On the varnish sides the sander certainly helped but it still took quite a while to get the stain off. In retrospect, I should have stripped the wood first and saved myself a lot of time sanding. Eventually though, I got the stain off (mostly). Around the edges of the tops of the tables there was ridged area that was too small for the electric sander. I tried for quite a while to sand it down by hand but couldn’t get through the varnish and stain. 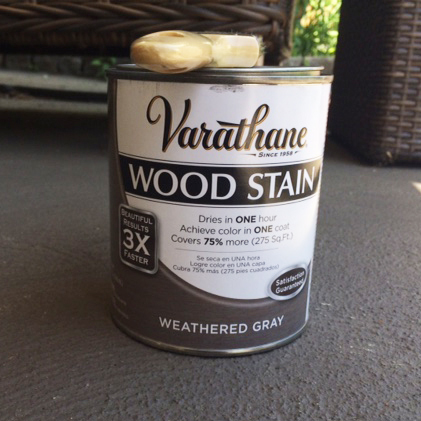 I had heard that chalk paint would cover any old stain and would give me the matte finish I was looking for. I went on Amzon and bought two jars of Americana Chalky Finish Paint in Carbon finish. 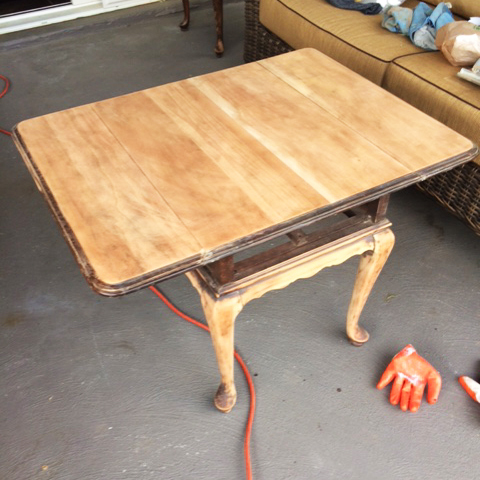 The chalk paint is so opaque it only required one coat to completely cover the tables and hide any remaining stain. 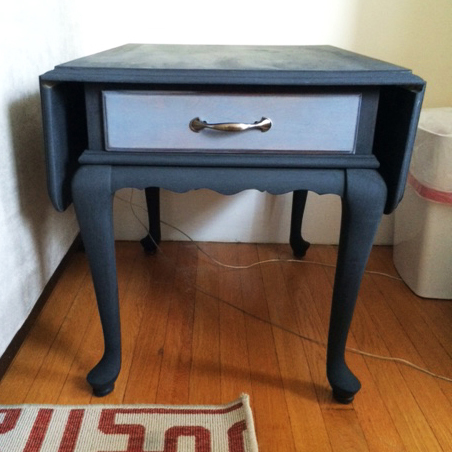 I wanted give the tables a little more visual interest so I opted to paint the drawers in a dark grey wood stain. Since the rest of the tables would be matte, I didn’t want to the drawers looking too transparent. It took about 3 coats of stain to reach the desired effect since the stain is meant to let the natural wood show through. I really liked this weathered grey stain I got at Home Depot and will definitely be using it again in a future project. For a novice upcycler, I think the finished product looks pretty good. Little bits was my childhood nickname within my family. The pseudonym had nothing to do with my being especially little (I was 9 lbs at birth), but applied to me in that it sounds similar to Elizabeth (my name) when spoken. While thinking about creating a blog I made of list of things which felt intrinsic to how I see the world and a theme that appeared throughout was nostalgia or sentimentality about the places I have called home. I have always loved to collect beautiful and interesting things, especially anything which feels personally sentimental. My hope for this blog is to create an evolving scrapbook of collections or moments which speak to me. Little bits of inspiration. I am an interior design enthusiast and a graphic designer by profession. I am fortunate to live in a beautiful neighborhood in an incredible city where beauty and history are everywhere I look.